In the decades to come, energy from all sources will be needed to meet rising global demand. Canada’s oil sands are one of the most significant energy resources remaining. They can play an important role in the energy mix, but they must be developed responsibly. Oil sands consist of bitumen – a heavy oil – mixed with sand, water and clay. Some of the oil sands lie close to the surface, where they can be mined. The rest lie too deep for mining and the bitumen is produced through conventional wells, often using steam injected into the reservoir to ease its flow. The Athabasca Oil Sands Project (AOSP, Shell interest 60%) uses giant trucks and mechanical shovels to extract the oil sands mixture at its Muskeg River and Jackpine mines. Once separated, the bitumen is diluted with solvent for piping to the Scotford Upgrader where it is converted into synthetic crude oil. In 2011, the AOSP produced around 197,000 barrels of oil equivalent (boe) a day. Production from deeper-lying, or in situ, oil sands operations was around 17,000 boe a day (Shell share 100%). Production from oil sands accounted for 4.2% of Shell’s global oil and gas production in 2011. Some opposition exists to the development of oil sands resources. Producing and processing them is energy and water intensive. Mining also involves disturbing land. For the oil sands industry to grow in the right way, reducing environmental impacts is vital. We are working to improve our ability to manage greenhouse gas emissions, and to use land and water more effectively. In early 2012, Shell helped launch a consortium of energy companies that will share knowledge and develop innovative technologies together to improve environmental performance across the oil sands industry. Our use of local suppliers creates jobs and supports economic development. We are seeking to increase the number of aboriginal people in our workforce through apprenticeships and other programmes. Shell has spent over C$1 billion on contracts with aboriginal companies since 2005. Overall CO2 emissions from oil sands, from mining to processing to use as a transport fuel, are around 5 to 15% higher than conventional crude oil, according to Cambridge Energy Research Associates. We already produce fuels at the lower end of this spectrum. Carbon capture and storage (CCS) technology would further close this gap. Shell is developing plans for large-scale CCS at our oil sands operations. If our proposed Quest project goes ahead, it will potentially capture and store deep underground more than 1 million tonnes of CO2 a year from our upgrader (see Carbon capture and storage). 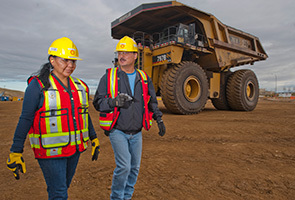 The total direct emissions from our oil sands operations in 2011 – including mining, in situ and upgrading – were 4.9 million tonnes of CO2 equivalent. This was an increase over 2010 emissions, reflecting a full year of operations at our new Jackpine Mine and the expansion of production at the Scotford Upgrader in 2011. It represents around 6.6% of Shell’s global direct greenhouse gas emissions in 2011 from facilities we operate. We are continuing to work to improve energy efficiency. For example, at our Muskeg River mine we use less hot water to separate the bitumen from the oil sands mixture than in the traditional process. We are also investigating the use of cleaner fuels, such as liquefied natural gas, to power the trucks and shovels in our mining operations. Shell uses two to three barrels of water from the Athabasca River to extract one barrel of bitumen from our mining operations. While Shell has permits to withdraw 0.6% of the Athabasca River’s average annual flow, we used less than 0.12% in 2011. Water used to extract bitumen is recycled. In 2011, around 78% of water used in the bitumen extraction process was recycled at our two mines. We continue to explore opportunities to increase the amount of water recycled at our operations and use more groundwater from the site to reduce our use of river water. Tailings are the mix of water, sand, clay and residual hydrocarbons that remains after the bitumen is separated. They contain concentrated naturally occurring chemicals that are toxic and are held in ponds or mined pits until they can be dried for use in land reclamation. The area covered by these tailings ponds at the Muskeg River and Jackpine mines reduced to 23 km2 by the end of 2011, from 24 km2 the previous year. Once the tailings have settled and dried, we use them to restore the natural contour of the land before laying topsoil and planting suitable vegetation. Regulations require that all land disturbed by operations must be returned to a natural state that can support local plants and animals. Reclamation work takes several decades to complete, but we continue to work to improve tailings technology to speed up the process. Since 2005, we have invested nearly C$200 million in tailings research, including setting up an advanced test facility at Muskeg River Mine. Shell and other companies have agreed to set aside intellectual property rights to research into more advanced tailings management. We are also working with aboriginal neighbours to incorporate traditional knowledge into our management of land and reclamation efforts. Aboriginal elders have helped us understand the roles land, vegetation and wildlife each play in their culture.